As fans eagerly await the opening, Atlas Shrugged launches big by counting down the seconds. The Strike Productions announced today the release of its Official Atlas Shrugged Movie Web Site - http://www.AtlasShruggedPart1.com. The web site, and accompanying mobile web application, were designed and developed by Scott J. DeSapio - an objectivist and long time admirer of Ayn Rand who has been brought on as the head of the online marketing efforts for the movie. “We are excited and thrilled to have Scott on the team. As if lifted from the pages of the book, his vision, drive and overall impact has been immeasurable. 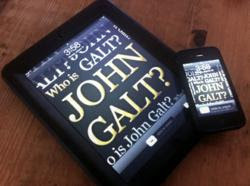 The site is beautiful and we can’t wait for fans to see it.” said Harmon Kaslow, producer of the Atlas Shrugged Movie. The Atlas Shrugged Movie, a movie based on Ayn Rand’s epic novel “Atlas Shrugged”, opens in limited release April 15, 2011. For more information, visit http://www.AtlasShruggedPart1.com.